Details have been released on the proposed downtown fire station which will replace the one that currently sits on prime real estate on Mass Ave. The new station will sit on the property that is currently occupied by the Red Cross, which itself will be moving to Meridian Street. The early returns on the design are not pretty, and are not fit for the urban environment. Fortunately, it is early in the process, and the design can still change before it is built. I hope that the current proposal is shelved in favor of a better design. Seriously? So AXIS on crack again, eh? Embarrassing!!! I’m guessing the design is a product of the NIMBYS within the historic neighborhood associations around this area. Stuck in the past a bit??? As a resident of Chatham Arch, I can tell you it hasn’t been formally discussed by CANA, but a special meeting is scheduled for next week. 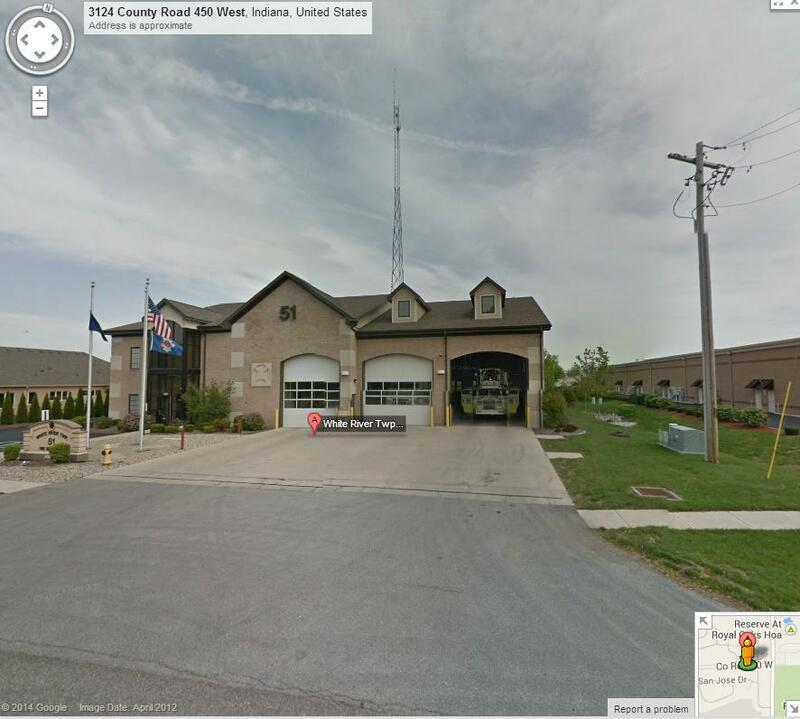 There is a really compact old urban fire station (#12) on Sherman Drive just north of Vermont that would be better inspiration. Looks like the address is 408 Sherman Drive if anyone wants to look it up. Nice design for an urban neighborhood. Hoping we can get a better design than what was proposed. Another amazing, though unfortunately abandoned fire station is at the corner of Rader St. and Udell St. I’m assuming they can’t use the old designs like this and the Ghostbusters HQ because they’re no longer up to fire code or something…cmon, they’re firemen!, they – of all people- should be fine. and the land use for this new plan is just as appalling as the Red Cross, except on 2014, they should know better. is there any reason why it would have to be so wasteful? I photographed that old fire station in this post. I have it on good authority that this was not Axis’ first design, which was much more in line with the modern aesthetic for which they are known. That design was rejected by IFD and the project developer who both pushed the traditional approach now presented for approval, despite Axis’ best efforts and those of certain folks at the City. Sounds like the city pushed Axis to design this garbage. What a tremendous disappointment Adam Thies has been! Paul, you know as well as I, Adam isn’t calling the shots on this one. That’s a deputy mayor. Interesting design. Not a huge fan of it in general. Question for you all. 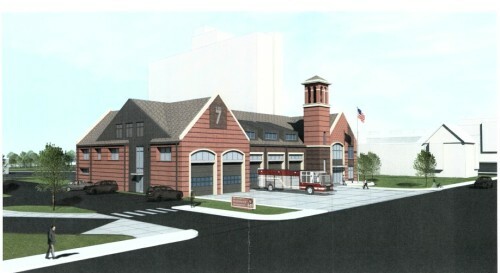 I think it looks a lot like a simple redesign of the new fire station 5 on the NW side of downtown. Thoughts? Duplicating the new Station 5 would be an improvement. I get that the firefighters dictate the basic layout and form of a fire station. But the facade design can be drastically different for the same building footprint and cost. Come on, man. I strongly doubt that the fire chief has more weight with the Mayor in matters of urban form and redevelopment. I get that Adam has to pick his battles, but this is probably a good place to start. Come on, man. DMD planning staff and the Regional Center Hearing Examiner work for Adam Thies and Brad Beaubien. It is disingenuous to assert that these two design-aware people have nothing to say in this process, or that there is nothing they can do about this poor suburban design. I know them both, and I think they want to make a positive impact; I encourage them both to do so in this case. Gotta start somewhere. Come on, man. I agree with Chris Barnett. I can’t understand whats going on here except a bunch of frustrated wannabe Architects that are totally unqualified to design anything are calling the shots. For the planning staff to recommend approval tells me that there more to this. You know everyone in charge of that is old right? I mean have you dealt with the building commission before, they are all well over 50 aside from 1 woman and possibly one of the guys, but and 3 of them are probably 70+…. old people only like traditional, suburban buildings, regardless of appropriateness. Ageism is not appropriate on Urban Indy. Besides, a much more attractive and modern-looking Fire Station is being built now. The two main roads fronting the proposed station (Fort Wayne Ave and East St) are both one way. Is there any talk of changing or modifying these, to increase accessibility for the site? One of the commenters on the IBJ article who seemed to be “in the know” indicated that there were no plans to change Central to be two way. We’ll see if that changes after a few houses burn down in the Old Northside or a fire truck hits a car trying to short-cut up Central. Actually, this fire station sits on the 2 way portion of Fort Wayne Avenue. Chris Barnett: you may “strongly doubt that the Chief has more weight with the Mayor on urban form and development” but, sadly, in this case you are wrong. The battle was picked and lost. So you’re saying that the IFD chief has more power than the mayor? I’m not doubting you, but it’s sad for this city if true. You misread what I said – I said, in this case, the Chief has more weight with the Mayor than the Mayor’s own staff. So what is a better design? 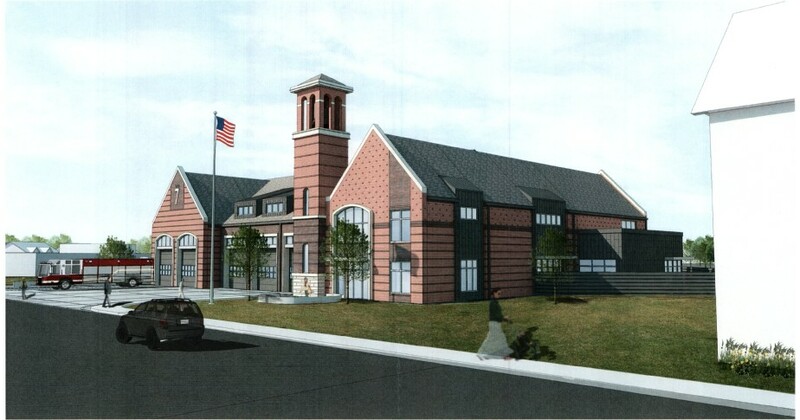 It’s a fire station and it looks like one… what’s the big deal? Does every new building have to look industrial and modern? Does the 1800s Buschmann Block across the street from this site look “industrial and modern”? What about 1010 Central, just north of there? Or the newer townhome/condos on St. Joe St just west? This design looks to be inspired mainly by the Renaissance Place development, which is not exactly a good example of urban design. Using solid garage doors and visible pitched& gabled roofs as building facades is exceedingly suburban, but can be overcome by using clear panels and parapets instead to better fit in the surroundings. 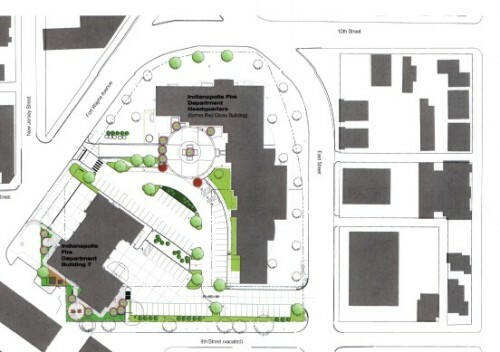 The Shelbyville example above is a good urban infill station. There is another good example in Columbus, IN at their downtown station/HQ at 11th & Washington. The Moderne part of the Columbus Fire station is great. They also did a good adding the addition to the back side of the station. Yes, the Moderne part of the station is old & original. I was thinking of the addition, and the way it kept mature trees in place, and it fits perfectly in a small-city downtown. The whole thing is a bit sprawling for Downtown Indy, but the design principles…making it fit its surroundings…could still guide a design for this site. Scott, you ask what the big deal is? Seriously? The problem iS this proposal is a product of local politics at work…and the above comments regarding IFD and the DEPUTY MAYOR having won the battle is CORRECT. This design is suitable for the suburbs or a small town but does not fit within the REGIONAL CENTER guidelines (meaning NOT URBAN IN FORM). So Scott, one question: WHY CAN’T INDY LET ADAM THIES do his job as DMD? Why is Adam being micro-managed by a politician who obviously has no understanding of design and good urban development? What’s that you say: “WORLD CLASS CITY”??????? The priorities in this town are a JOKE!!! Have anyone notice that this proposal mimics the existing historical station on MASS AVE & Park. Any thoughts? Well, both have a tower. But that’s about it. The old station is Italianate in style. The new one is “suburban”. For another example with tower, there’s the old firehouse on Washington just east of Shelby that’s now part of Angie’s List. It would be a far better design inspiration. Another example of a good urban form is the old “Fire Headquarters” at New York and Alabama. None of those have big sloped roofs facing the primary facade. what exactly do you need so badly? there is already a fire station in existence… so what are you talking about?